Therefore, it is no question that as the importance of social media for customer service and marketing grows, so has the popularity of tools needed to organize, manage, and update those social media pages. These said tools play a part in helping further revolutionize the marketing world by creating a competitive advantage among businesses if of course, utilized well. There are different marketing tools available for different kinds of uses. Some that businesses might need to keep up with social engagement, some to manage various social media pages, others to effectively monitor competitors to improve brand strategy, and more. With a handful of tools at your reach to boost brand awareness or simply organize content management, it is important to know what kind of service you need to gain advantage in the world of social media. Buffer is an ever-so popular tool with simple features that can be used both by professionals and beginners. It is mostly used for social media management and is effective in staying active and efficient in engaging with your audience online. It helps you organize and schedule your social media posts and manage multiple accounts including those you have on Facebook, Twitter, Instagram, Pinterest, LinkedIn and Google+. An excellent platform to upload photos and videos with its corresponding caption, Buffer also allows you to track your performance by providing the engagement stats and details of your posts which in turn, gives you a chance to further improve your brand’s content. Another feature that makes it so popular is how it also allows social media managers to reply to posts on their social media pages, so you won’t have to log in and out of your individual profiles every time to check inquiries and concerns your customers might have. If you’re looking only for a tool that will give you a hand in keeping up with social engagement, Sprout Social is the perfect tool for you! We all know that responding timely to tens and thousands of customer messages online can take hours, if not the entire day. Well life can be so much better with this tool since it has a feature called the “smart box” which centralizes all messages (in all your accounts!) into a stream where you can track inbound and outbound responses easily, making conversing with your customers and joining conversations much more comfortable and efficient. Responding to customer messages on social media show how much you care about your consumers, and you can do just that with Sprout Social. Who knows? Maybe you can even ignite brand loyalty within your consumer space in no time. You know what they say: A picture can say a thousand words. This cannot be emphasized even more in the world of social media because there are times when images are much more powerful than texts. An enticing photo can catch the attention of consumers more than anything else and in times when you need a tool to help you out in this department, trust that Canva’s got your back. Used by more than 10 million people in 179 countries, Canva has greatly impacted social media with its amazing user interface that users will find easy to navigate even if they’re not very well-versed in design. It provides both professionals and beginners gorgeous templates for various visual needs as well as millions of stock photos, illustrations, vectors users can choose from. Take it from us, these awesome Canva features can definitely make your social posts worthy of a million and one likes. If you’re hunting for a tool that’s more on the analytical side rather than the design and concept aspect of social media marketing, fear not because Buzzsumo is here to the rescue! Get complex stats to find out what’s hot or not with your audience by using research keywords and trending topics to define what your audience will love. Your business can use this information in various ways, such as coming up with content in line with the stats so that your consumers can appreciate and engage with your content more. Buzzsumo is a great social media marketing tool to use when it comes to exploring and searching for content ideas when your posts are in a dump, or in need of some performance boosting remedy. 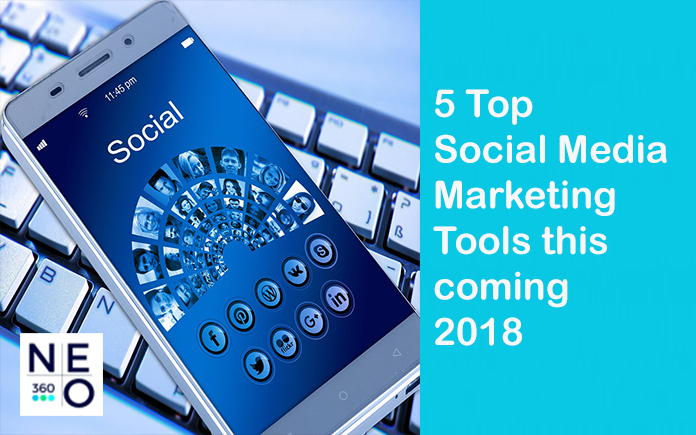 A tool that’s mostly used for competitive analysis, SocialClout enables you to figure out the latest industry trends that can be utilized to keep your brand and social media content up to date. SocialClout also has a feature where you can use your competitor’s data as an asset to help you explore more ways to improve current business strategies. With this helpful tool, you can derive insight in relation to your competitor’s products, brands and services, making it more advantageous for you. So have you figured out the social media marketing tool/s perfect for your business? Let us know if we can help! Keep up with the latest social media trends with us at NEO360!